This past weekend was a special one! 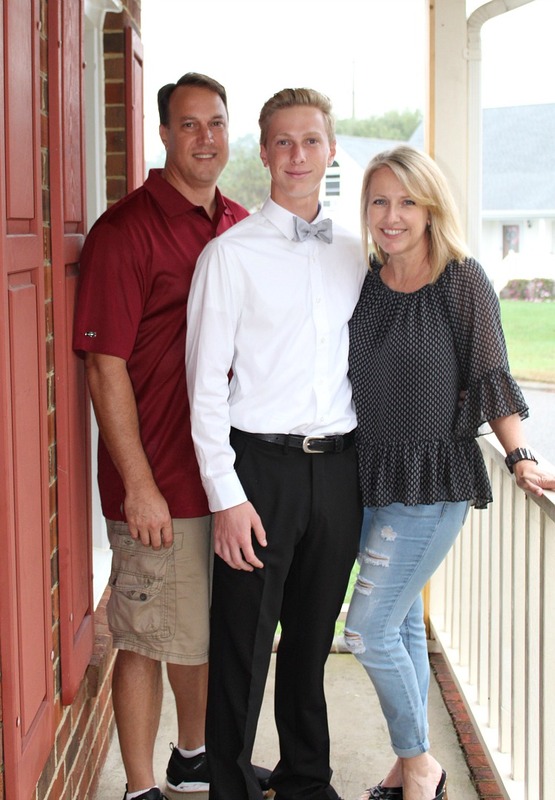 My son attended his first homecoming dance. We spent last week finding just the right outfit and shoes. 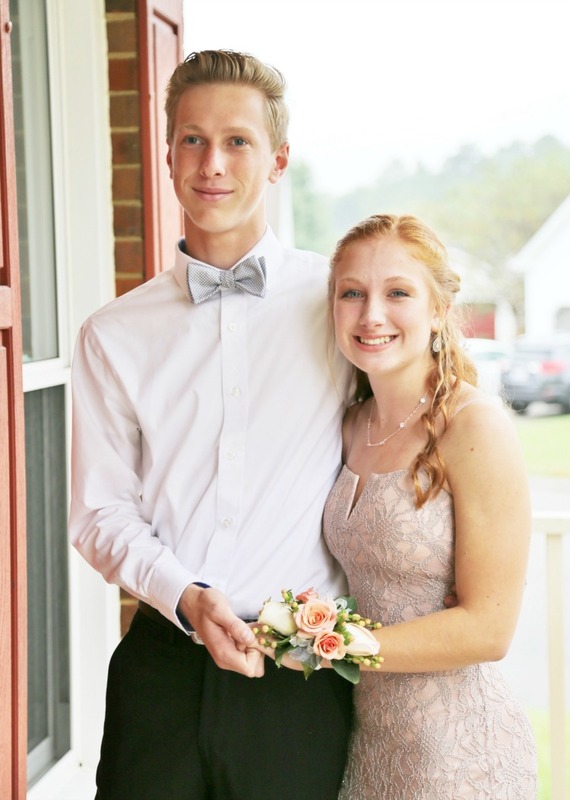 This being Matthew’s first dance, he was unaware that his date needed a corsage. Here comes mom to the rescue! 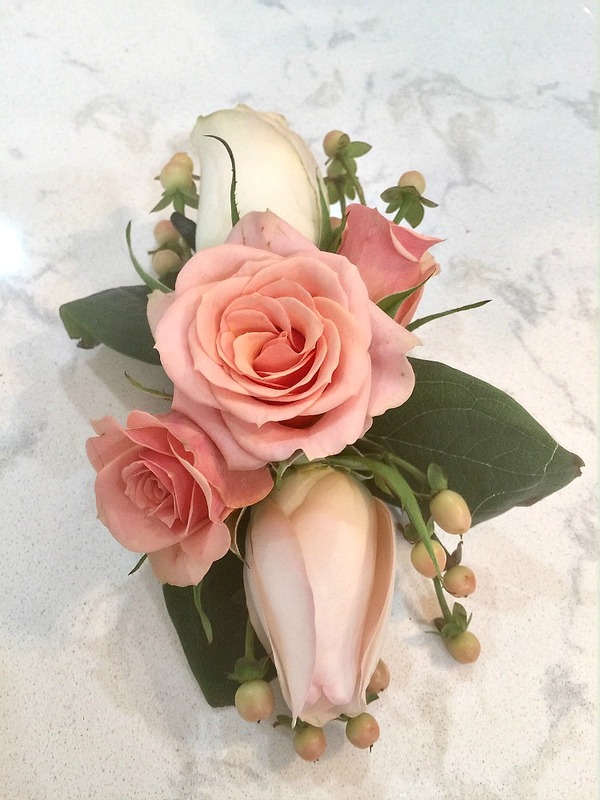 With two older daughters, I have made a few corsages and boutineers in my day and really enjoyed creating them. 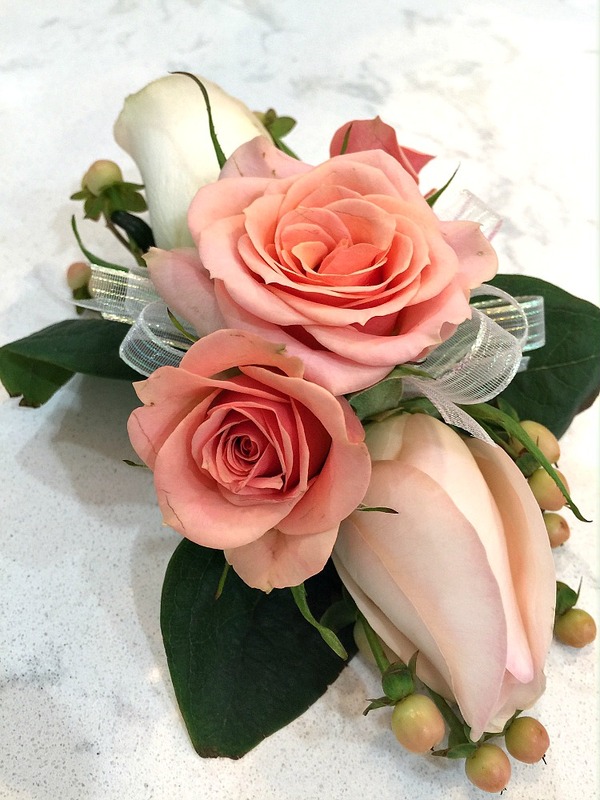 Corsages can be quite expensive and yet they are quite easy to make with simple bouquets from the grocery store. 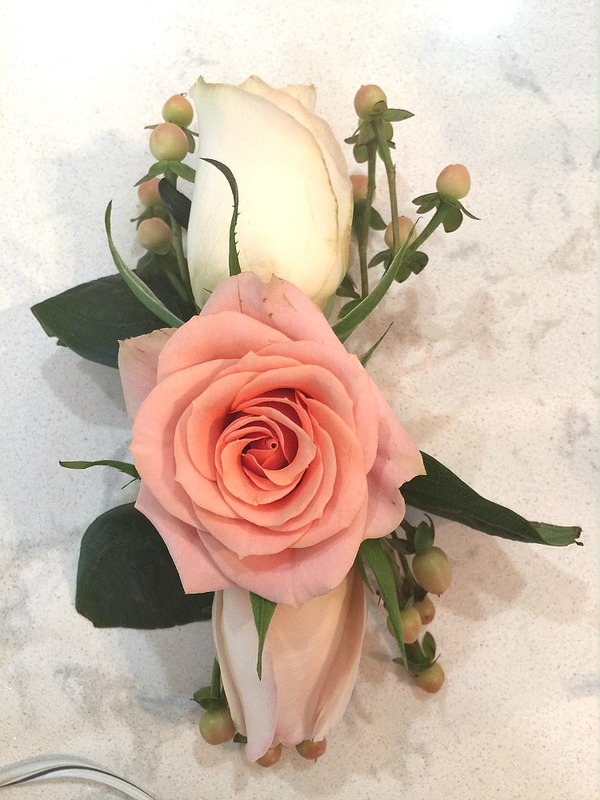 Today I’m happy to share with you how to make a blush rose and hypernicum berry DIY Wrist Corsage, perfect for homecoming or prom. Corsages can be as simple or as elaborate has you desire! The first thing to find out is the color of her dress and then go from there. I love buying a few small floral bunches from the grocery store to work with. I know only a few flowers will be required for the corsage, but then I am left with a lovely bouquet for myself afterwards! Call it mama’s payment! The bunch of 10 ‘Senorita’ blush tea roses cost $8, the spray roses were $4 and hypernicum berries were $6. 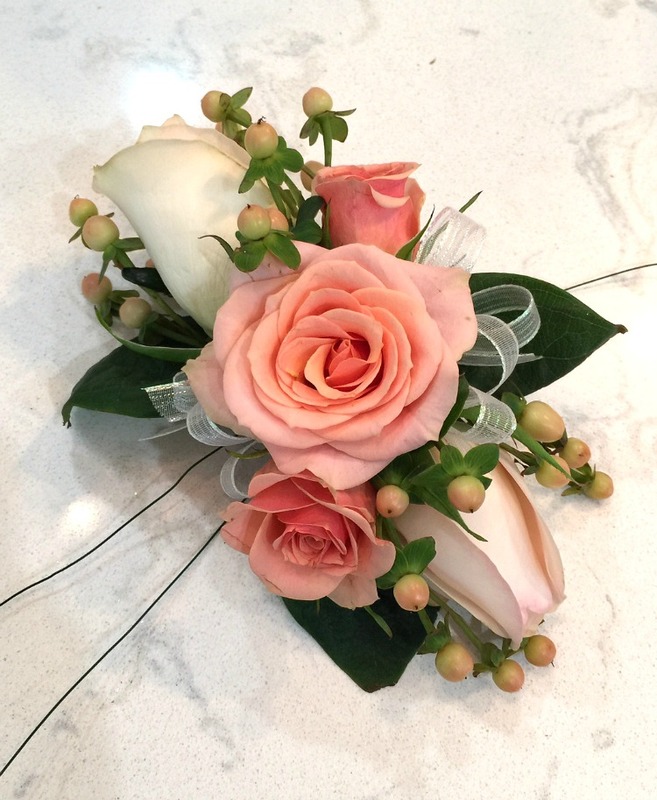 Most grocery store florists will be happy to sell you corsage wrist bands but you can also buy them online for even less (link provided above). Some can be elastic or velcro. All come with a metal clasp that has 2 prongs on each end. These are where you can fasten stems or wires to. I use the prongs in different ways depending upon the type of corsage I’m making. 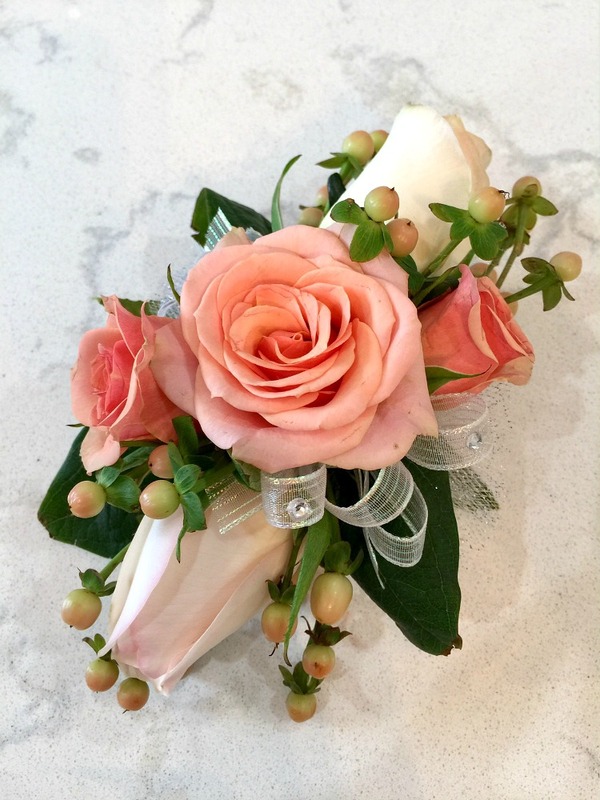 For this corsage I chose sturdy tea roses and spray roses. 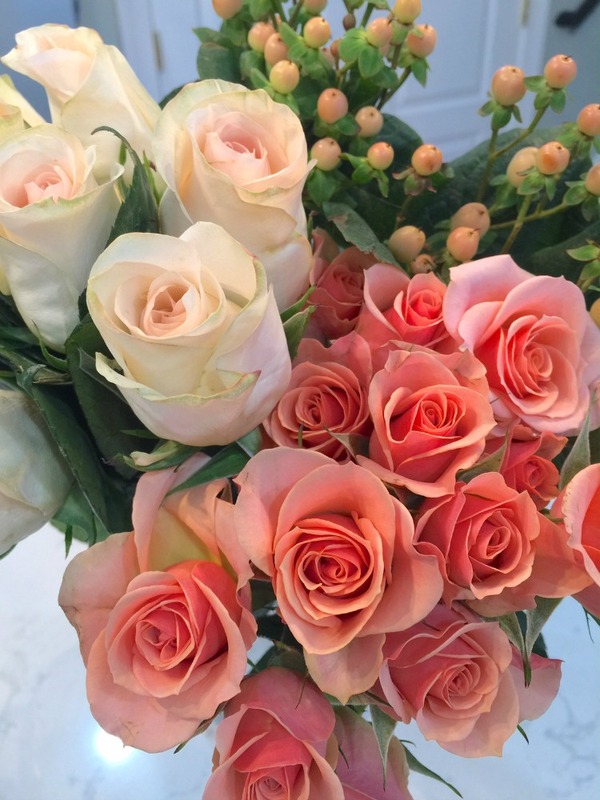 Roses keep their shape well and don’t wilt as quickly as some other types of flowers. I buy my flowers the day before the dance and try to keep them in the refrigerator if possible, unless the buds are tightly closed and you want them open, then leave them out at room temperature for a bit. 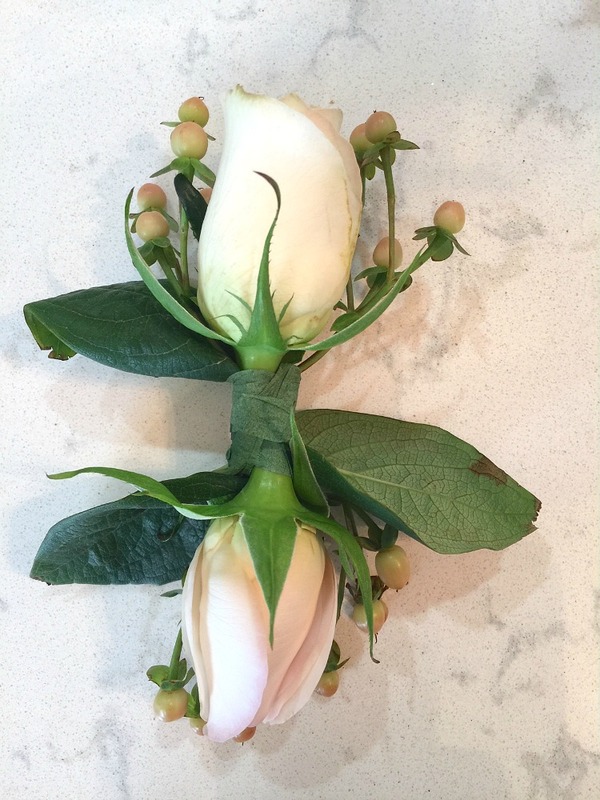 Step 1: I chose two ‘Senorita’ roses that are creamy white with just a hint of blush, and cut their stems to one inch. Remove any exterior petals that might be blemished. Feel free to also remove multiple petals to get the rose buds down to the size you desire. Step 2: Wrap the two cut ends of the roses together with floral tape. Step 3: Clip 2 hypernicum berry sprigs and lay them behind each rose bud and wrap again with floral tape. 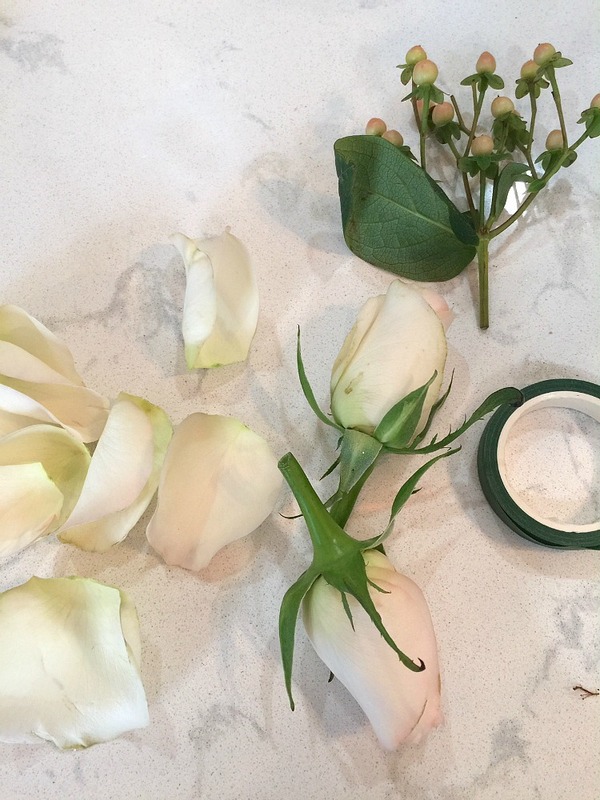 Step 4: Clip a larger, open, blush spray rose bud, leaving 1/4 inch stem. 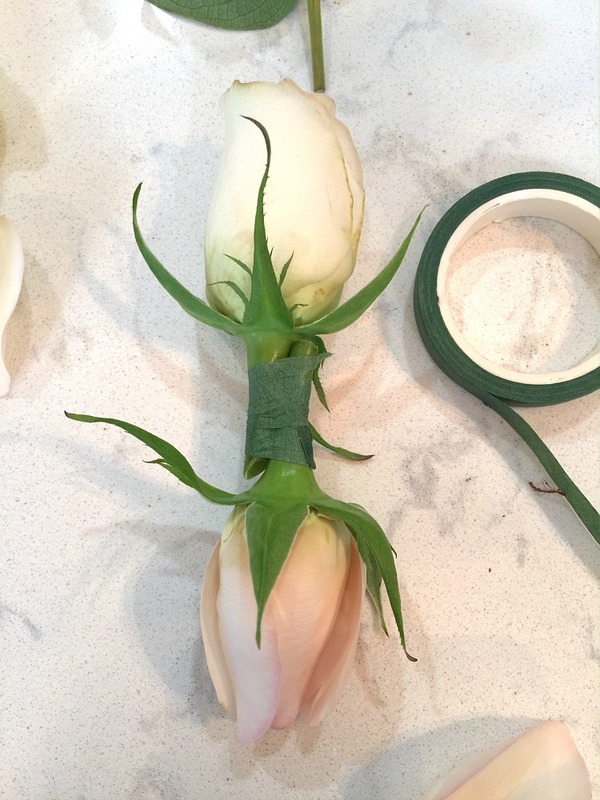 Put a large dollap of hot glue on the stem and place in the middle of the two creamy roses. Allow glue to cool a minute or two. Step 5: Clip 2 smaller spray rose buds and hot glue them in a diagonal pattern on either side of the center rose. Step 6: Create 2 bows. 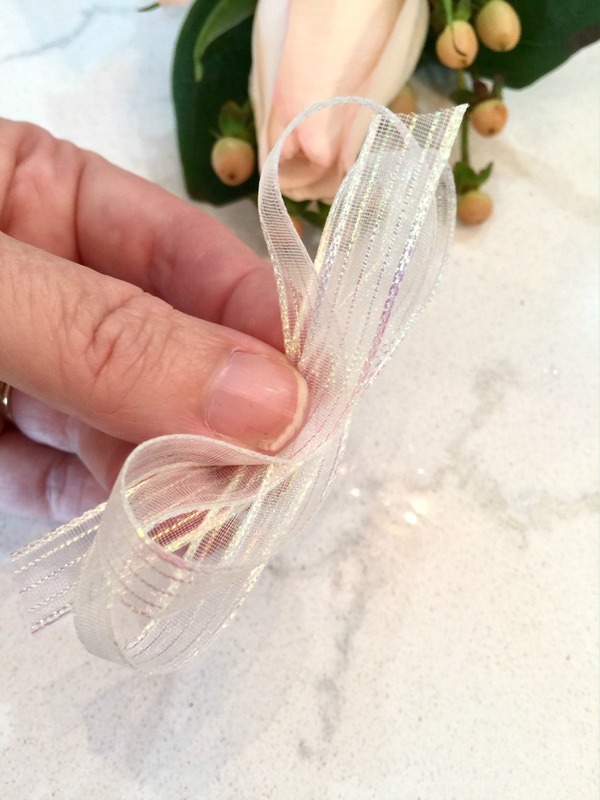 Take a coordinating piece of ribbon and fold it on itself, accordian style and secure in the middle with floral wire. Step 7: Hot glue the bows on opposite sides of the spray roses. Step 8: Cut 2 long pieces of floral wire and thread each wire over the stems of the large tea roses. Twist each wire together. Step 9: Now is the time to attach the corsage to the wristlet. Put a generous amount of glue onto the metal wristlet clip. 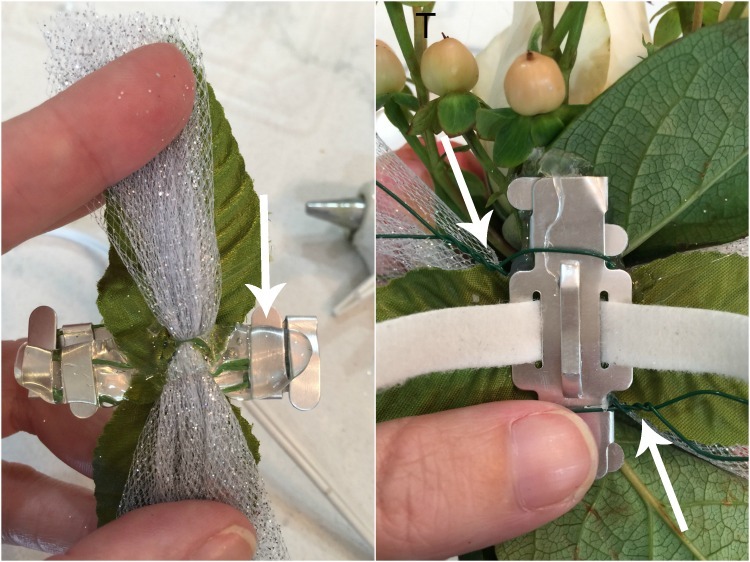 Press the corsage onto the clip and allow it to cool completely. Next, wrap the wires around each end of the metal clip and use scissors or wire cutters to clip the ends and tuck under the flowers. IMPORTANT TIP: Give your corsage the shake test! Hang onto the wristlet strap and gently shake. If everything feels secure then you are good to go! If not, then add more wire or hot glue where needed. Feel free to embellish the DIY corsage even more with rhinestones. Store the corsage in the fridge until the event. 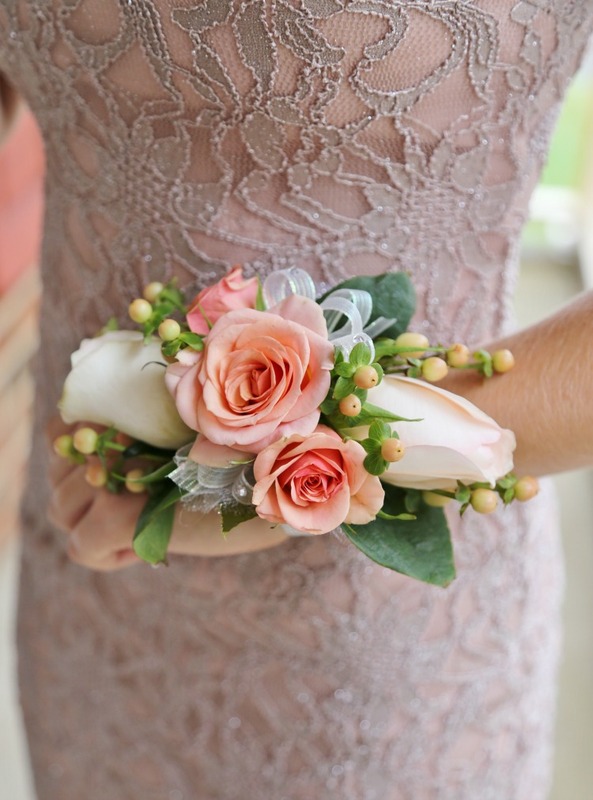 I absolutely love how this blush rose DIY Wrist Corsage turned out! Best of all Matt’s girlfriend loved it. Doesn’t she look beautiful? They are such good friends and such a cute couple. She is an amazing athlete and has a heart of gold. She loves to bake and brings friends, neighbors or anyone in need fresh baked goods to cheer them up! I think I’ve gained 5 pounds since they started dating. Ha! Here’s a little pic of my hubs and I with our son. They grow up fast don’t they? 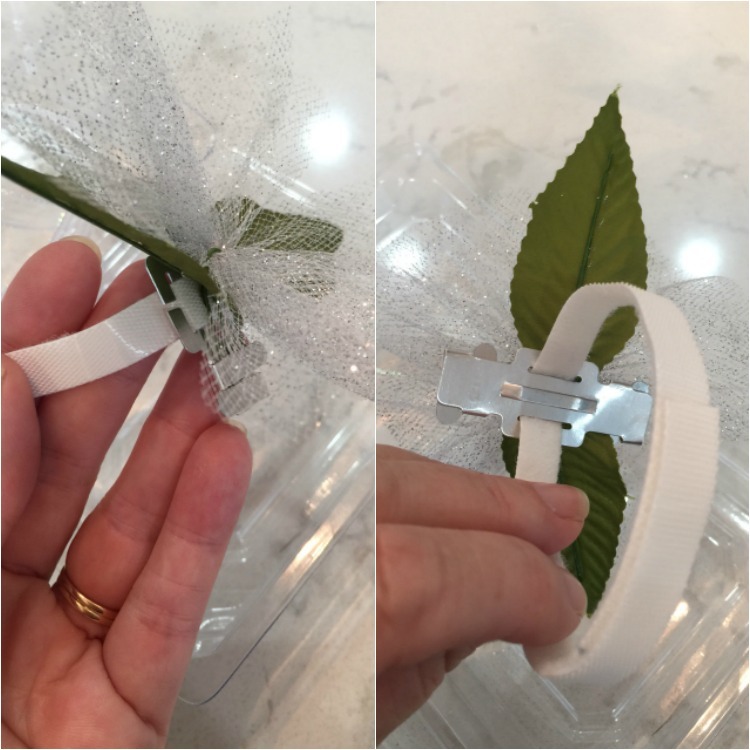 I hope this post gives you confidence to try to make a DIY wrist corsage some day! Believe in your beautiful, creative self! Great job making those corsages, saving some money to get something a lot nicer is worth the effort. Wish had known could do this when my sons were still dating in high school. Your corsages are so well put together, glad your son’s date liked hers so much. Well done! This looks so professional! Made one today for my daughter’s homecoming today-looked beautiful and was so much fun! Took me about an hour, which included me making my own wristlet. Directions were clear, pictures were a huge help. This was very last-minute (boyfriend broke up with her Monday night! ), so I made it work with mini carnations & three tea roses. Could not tell the difference from the pros! Beautiful! I’m going to give it a try! Any idea what the total cost of this was? Obviously, there are leftovers of tape, wire, and ribbon, but I’d like to know what the initial investment of those materials would cost (assuming equal flower cost). Thanks! I listed the prices in the post and links to all the supplies are listed too. The bunch of 10 ‘Senorita’ blush tea roses cost $8, the spray roses were $4 and hypernicum berries were $6. But because I used so little out of each bunch the overall price for the corsage was under $5 and mama was left with a gorgeous bouquet for my kitchen table!!!! Yay! You can find the rhinestones for 99cents at walmart and also the wire and tape are about a dollar each. They are fun to make! I hope you give it a try!